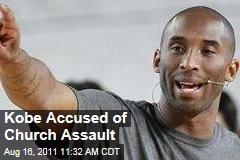 Kobe Bryant Injured The Wrist of A Fellow Churchgoer? How Come? Kobe Bryant is again in the headlines of newspapers again but this time it's not about his tours in the different Asian countries. It's about the news that circulated all over the internet saying that the Los Angeles Laker Guard Mr. Kobe Bryant hurt someone while attending a mass in his church. Kobe was reportedly attending a mass in his church last Sunday and then while at it, the news said that he saw and caught an unknown person known only as his "fellow church-goer", secretly taking pictures of him and his family. The man (his fellow church-goer) is now claiming that Kobe approached him and injured his wrist that's why he's in the hospital right now. The news also added that after the incident, Kobe checked the phone of the said "fellow church-goer" but he found no pictures of him and his family members in it.